This is one of our classic family recipes. My grandma made cobbler every summer when we would go visit. She always made raspberry cobbler since she had both red raspberry and black raspberry bushes in her yard. Oh, I wish we could grow raspberries here! We already made two blackberry cobblers which were wonderful. It seems I hadn’t made cobbler for the boys before, they were amazed by it and declared it their favorite treat. What isn’t to like, fresh fruit in a sweet gooey cake like mess served with whipped cream or ice cream?! Here in the South cobblers are usually peach. Now that our South Carolina peaches are in season the boys and I were all about making some peach cobbler. After all, I am raising Southern boys now! This is my grandma’s recipe and I haven’t changed a thing, well the sugar a little. This recipe couldn’t be easier. 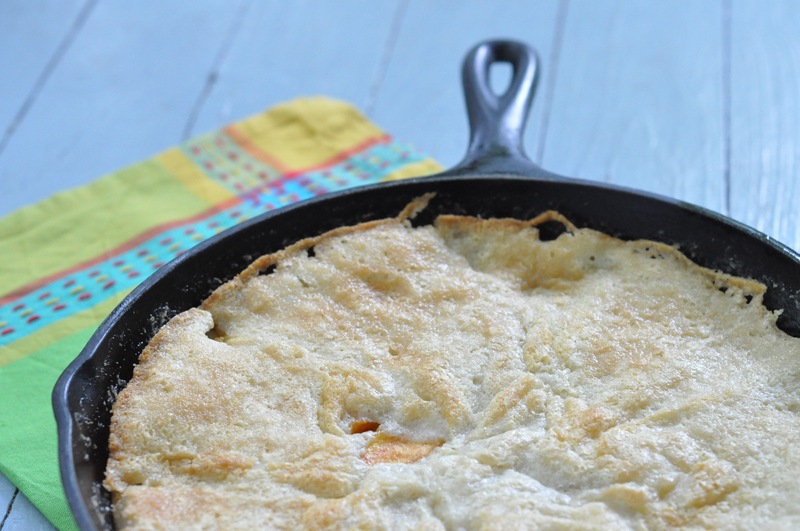 It can be made in an 8×8 pan or a cast iron skillet. It also works with berries or other stone fruits if you don’t like peaches. All you do is melt the butter, pour batter on top, then the fruit and sprinkle with sugar. The original recipe calls for 1/4 to one full cup of sugar sprinkled on top. I find 1/4 cup to be plenty, it is still quite sweet but also gets the crunchy top from the sugar crystallizing a little. Preheat oven to 350 degrees. Melt the butter in an 8×8 inch pan or a 10 inch cast iron skillet. In a small bowl whisk together the milk, 1 cup of sugar, flour and baking powder. Pour this batter over the melted butter, DO NOT STIR. Place the peaches evenly over the batter and sprinkle with the 1/4 cup of sugar. Bake for 40 minutes. Best served warm with vanilla ice cream or whipped cream (we enjoyed it with vanilla cinnamon whipped cream). 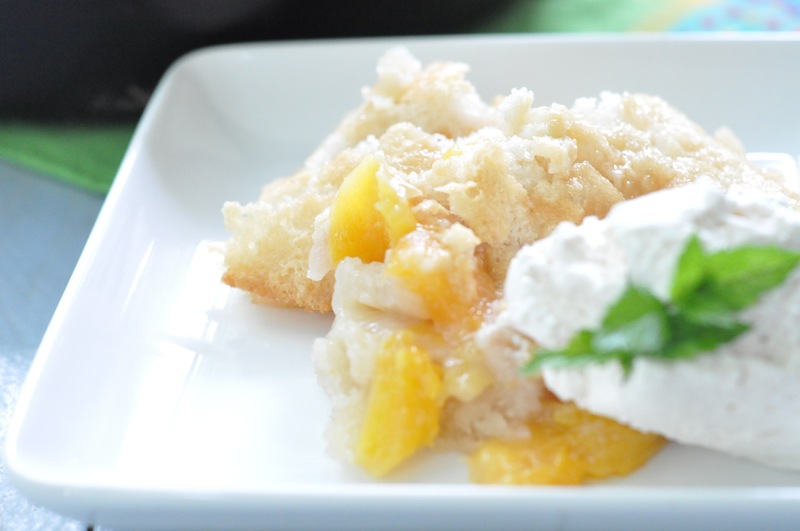 This entry was posted in Dessert and tagged berries, classic, cobbler, easy, kid friendly, Southern, stone fruit on July 11, 2014 by Gretchen. It was yummy! Thanks for stopping by! Yummy indeed! Enjoy your week. It certainly was delicious! Thanks! I love grandma recipes. One can never go wrong with them. I have just finished the last scoop of my vanilla ice cream. What a shame. The recipe is so simple I must try it during the weekend. I shall let you know how it turns out. Thanks for visiting me. I have been up and down so much this week. No time to sit down properly. But imagine if I had nothing to do. I would be complaining how bored I was. Have a lovely weekend! XOXO to the Southern boys!!! Family recipes and the memories they bring are indeed wonderful. Our schedules are hectic as well. Always doing something! Luckily swim is over soon and I hope to post more after that. I simply can’t photograph much with this insane schedule! hurrah for the cobbler! That looks amazing. Baking it in cast-iron is golden 🙂 And love that it’s a family recipe. Cast iron is indeed fun! I just started using it again every now and then. Family recipes are indeed great, both for the flavor and memories. Oh, tomato cobbler sounds delish! I will look into that soon. This looks delicious, it’s one of those ubiquitous American dishes I’ve never tried but now really want to! Thanks! Go ahead and try! It is delicious. It is so yummy and so many possibilities with all the fruits! 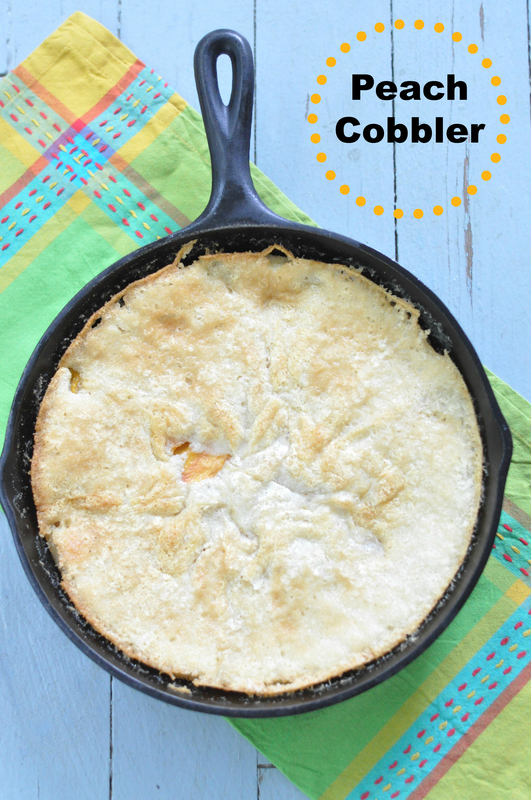 Your cobbler looks delishious! I love that type of dessert or sweet dinner! I bought some really lush apricots for sorbet last weekend, now I’m frustrated that i didnt see your cobbler earlier!